What Are the Best Tips for Viola Care? The best tips for viola care are to keep the instrument away from extreme temperature changes, keep it in its case when not in use, polish it, clean it, and care for the pegs and strings. Insuring a viola is also a good idea, as musical instruments can break easily or get lost or stolen. Using the viola daily can cause a lot of stress on it, so more maintenance is necessary the more one plays the instrument. Wood instruments require a lot of care. Putting pressure on the strings every day will cause them to wear out much faster, so ideally, one should have the skill to re-string a viola. 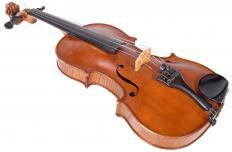 Grease and debris on the hands can also cause the wood finish to erode, so frequent viola cleaning is very important. Temperature also affects the sound and overall structure of the viola. Extreme temperature swings should be avoided at all costs, as they can potentially warp the wood permanently. Direct sunlight is also something that can damage the wood finish and strings. Viola care includes the foresight to keep the instrument away from very humid environments or strong sunlight. If one is unable to keep a viola away from very dry or hot areas, one can place a damp cloth inside the viola to give it some humidity. Dry and hot atmospheres can cause cracks to form in the viola. As such, one should never place a viola near a heat source or a heating vent. Leaving it in a hot vehicle for any period of time can also cause the varnish or glue to melt. A visible instrument left alone in a vehicle is also prone to theft. Proper viola care mandates that one should rarely touch the varnish on the instrument. Fingerprints and dirty fingers can cause permanent, unsightly damage to the viola. Since the varnish is very fragile, hard surfaces can also dent or nick the finish on the viola. There are special violin and viola cleaners that will safely remove any dirt or fingerprints without harming the varnish. The strings on the viola wear out over time, especially if rosin is allowed to sit on top of the strings for a long time. As such, daily viola care typically involves using a dry cloth to rub off the rosin after each use. If one plays the instrument frequently, all of the viola strings should be replaced after a year as well. Additionally, pegs can be lubricated with viola compound or made stickier with plain chalk. What Should I Know before I Buy a Viola? How Do I Choose the Best Viola for Kids?